Steven Daniels - Voxmasters: High Quality Audio Book Recording Services For Christian Authors. 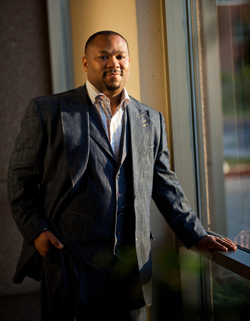 Steven Daniels is a gospel music songwriter, producer, and recording artist. He developed a strong passion for gospel music in his hometown of West Point, Mississippi. His father, Rev. Steve Daniels, Jr., introduced him to quartet music at the tender age of five, where Steven often emulated the band members by using an afro pick to play the guitar. After his father was called into the ministry, Steven’s passion for music grew into much more than playing an afro pick. It lead to him learning to play the piano and organ. In 1991, Steven relocated to St. Paul, Minnesota by following his father’s calling to pastor ShilohMissionaryBaptistChurch. He was appointed Minister of Music in 1994 and the music ministry has flourished incessantly both musically and spiritually. Steven’s songwriting career began in 1999 during the annual Christmas concert, in which the gospel choir performed two of his original writings. The songs and overwhelming display of talent were the precursor to the choir’s first live recording that took place in May of 2000. The album, entitled Live in St. Paul, was produced and written by Steven. It was a huge local success and served as a catalyst for the next self-titled project, Steven Daniels and Shiloh Gospel Choir. This album was a remake of their previous live recording and had a few additional songs. Steven Daniels and Shiloh Gospel Choir was blessed to receive substantial radio air play and led to Steven’s first opportunity of writing for a national artist. The Mississippi Mass Choir recorded his song, “God Is Keeping Me,” in 2004 and released it on their album, Not By Might Nor By Power in 2005. To date, “God Is Keeping Me” has been and continues to be a radio and concert hit. Steven is currently working on the production of a new recording that will take place in November of 2015. Steven is looking forward to his new experience with audio books. The passion that Steven has for spreading the gospel resonates in all of his songs and will soon transfer into each audio book. Most importantly, Steven’s love for Christ is what keeps the fire blazing in his heart as his ultimate passion is to inspire and save souls through every possible avenue.